Half of Room 23 attend food technology with Mrs Garrett each day 5 during period 3&4. Our fisrt day at food technology we made milk shake and the week after that we dicided to make our own drinks. At Food Technology we have been learning alot on how to cook. On the past few weeks we have been cooking apple and cinnamon, any muffins we like, different type of biscuits, potatoe with mash potatoe inside. Before we start to cook we have to wash our hands for 20 seconds, dry our hands for 20 seconds, put on aprons and get out equipment needed. On the last few weeks we had to choose any type of food and each week we have to make it healthier than the week before. My partner was Fatai and we chose to cook Kebabs. 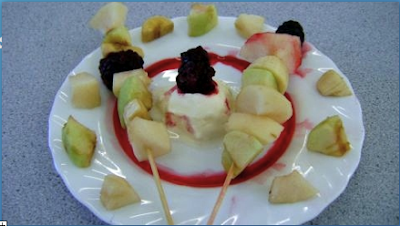 Me and Fatai first cooked chicken kebabs and the next week after that we made fruit kebabs to make it healthier. For the last lesson me and Danielle Moore chose to make Macaroni Cheese, it was delicious. We have learnt that we always have to wash and dry our hands for 20 seconds before you start cooking.